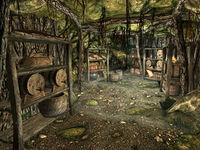 Mauhulakh's Longhouse is the longhouse inside the Narzulbur Orc Stronghold, where Chief Mauhulakh lives with his aunts and children. It contains two zones Mauhulakh's Longhouse and Mauhulakh's Cellar. It's a typical Orc longhouse with a central room for cooking and eating with wings at either end for sleeping. There is a large fireplace opposite the entrance with a three pots hanging over it, none of them usable as a cooking pot. The middle pot contains two baked potatoes. To the left is a long wooden table that has a leg of goat, two bulbs of garlic, two rock warbler eggs, a joint of raw beef, two leeks and three tomatoes in a bowl on top, while in a basket underneath are two cabbages. Hanging above is another leg of goat, a rabbit, a pheasant, a garlic braid, a bunch of dried elves ear and a bunch of dried frost mirriam. To the left of the table is a set of shelves holding mostly clutter with a bottle of alto wine, a bottle of wine, six bottles of Nord mead and a salt pile. There are two dining tables in the room, one on your left as you enter is set for four and holds two portions of grilled leeks, a bottle of Nord mead and a purple mountain flower in a tankard. The second table is to the right of the fireplace and is set for two and holds a rock warbler egg, a bottle of Nord mead and also has a purple mountain flower in a tankard. In the southeast corner is a set of shelves holding two leather strips, three common books, a red and green apple and a set of clothes. The wing to the northwest contains four single beds, two against each wall and is where Chief Mauhulakh sleeps along with his children Dushnamub and Urog. The room contains an end table, a dresser with a boiled creme treat on top, a master locked chest and at the end a pile of sacks and barrels mostly containing food, except one barrel that contains ingredients and has a common book on top. The southern wing contains a double bed where Bolar sleeps, with an iron mace leaning against the side of the bed. 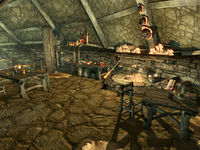 In this room, there is an end table, a dresser, an adept locked chest, and a small set of shelves holding copies of the Heavy Armor skill book The Knights of the Nine, The True Nature of Orcs and The Code of Malacath along with a bottle each of alto wine and wine. There is also a pickaxe leaning against these shelves. On top of the dresser, there is a small coin purse, a long taffy treat and an iron dagger. Despite lying below the longhouse, this area must be entered from outside. It is a small room with several sets of shelves against the walls. These hold a goat hide, a deer hide, three baskets containing potatoes, tomatoes and red and green apples, four sheaves of wheat, twenty-three bottles of Nord mead, a kettle containing a bottle of weak aversion to fire, a cow hide, a copy of the Two-handed skill book Song Of Hrormir and a chest with a leveled lock. Yatul doesn't sleep due to a bug. See here for details.